FRET NOT, GOOD READER, fret not. You may have already embarked upon the literary voyage that is my first “pre-view,” sent, as my Market Writer describes it, to screens and tablets around the world though in truth, this seems a most clumsy and inefficient means of sharing knowledge. During my trip to Mars via errant cannonball, we developed an instantaneous and permanent means of sharing information with nothing but the hairs from our heads, a slightly wilted tomato, and the vacuum of space. 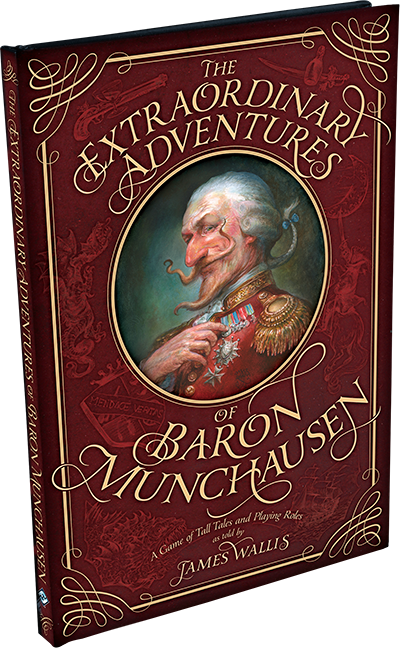 And this was but to pass the time, during an interlude between sessions of my game: The Extraordinary Adventures of Baron Munchausen! I can hear you gasp as you read that title (I assure you that I do, even from hundreds of miles away, for I keep my ears meticulously scrubbed and greased with hare-fat), for perhaps you were not aware: a newly expanded third edition of my game shall shortly grace the stores and the bookshelves of the nobly born and nobly spirited in every country of the world. The fifteenth day of December marks my book’s release, yet today, you may count yourself among the lucky, for I shall transport you with words to Araby. Unless, of course, you already reside within that country, in which case, I may offer a slightly discounted verbal voyage to the Moon, at the end of this piece. 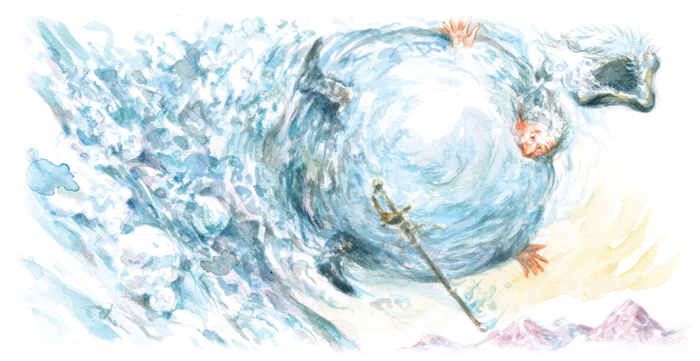 IT WAS UPON my most recent journey to Araby that I stayed with my old friend and fellow adventurer, Es-Sindibad of the Sea. I shall not bore you with other tales of my trip, such as how I tracked a djinni to its lair atop Mount Ararat, nor how I fought it to a standstill and then tricked it while it was dazed into entering the gold lamp I had brought with me and sealed it within that vessel using the signet ring that I had borrowed from Solomon for the purpose, for I am sure you have heard the narrative before: it is already much circulated. 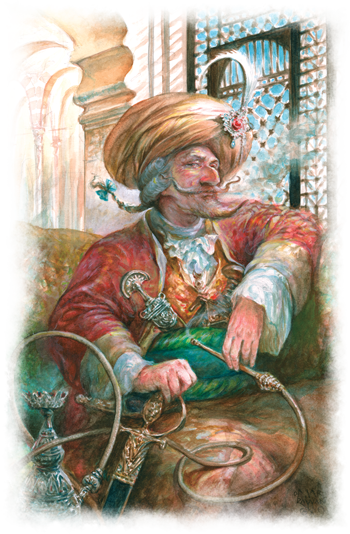 Upon my return to Baghdad, however, Es-Sindibad shared with me that he had been thrilled and delighted by my game for several months, and in fact, he recommends the purchase of the game most highly to anyone who may as yet be undecided. I assure you fence-sitters, the word of Es-Sindibad is to be trusted, despite the fact that he often consorts with Persians and Americans. 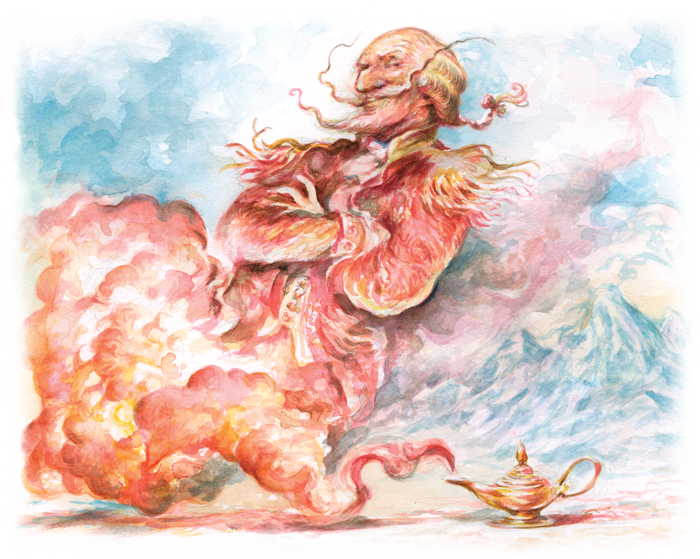 Still, alongside his recommendation, Es-Sindibad proposed a variant, inspired by the traditional tales of his own culture. Having tested this variant most dutifully upon the twin scales of nobility and amusement, I have found it most worthy—and indeed, I have chosen to reproduce it faithfully within my book, with only a few alterations to spelling, grammar, choice of words, choice of rules (since I am now a renowned expert in such matters), and penmanship. I can assure you, the last was horrific in the original. TAKING HIS INSTRUCTION FROM AN EXPERT, as all beginners and apprentices must, Es-Sindibad’s variation begins in the same fashion as my own game, though with three principal changes to the setup. Firstly, since gambling and games of chance are forbidden to Moslems, the coins of my own rules must be replaced with dates—a hardy and versatile fruit, which may also be eaten if the game goes overlong. Likewise, since alcohol is also forbidden to Moslems, its place within the workings of the rules may be taken by a refreshing draught of mint tea. It is my experience that the game suffers not at all from this substitution. After an appropriate period of shock at finding himself in such a condition, Es-Sindibad may then choose to take up the story himself, continuing on and weaving his newly acquired, beggarly position into his greater story. In this way, the stories of all players intersect and come together into a single whole, much like the feathered tapestries which I found so common near the headwaters of the Amazon. It is most diverting, but we must forge onward quickly, for we are promised to travel to the Moon in this same pre-view! In many circumstances to be sure, children should be seen but not heard. For a child who is both seen and heard is naught but a gadfly, interrupting its betters as a horsefly irritates a horse, while you can be sure that a child who is neither seen nor heard is in the kitchen wrapping the cat in ham, or down a rabbit-hole, or up a chimney, or being swapped for a changeling by imps, or somesuch other childish nonsense. Meanwhile, a child who is heard but not seen is either being loud in the next room or has mastered the art of invisibility, and both states are to be deplored in those below the age of ten. No, seen but not heard is the proper state for any child, and yet there must be chances for a child to speak, for their own education and ennobling. My Uncle, The Baron provides a fine opportunity for such. The original idea behind my game is simple, yet with history almost as long and noble as my nose, having come down to us from ancient Greece, where it was used, so I am informed, as a diversion by the poets Homer, Hesiod, Euripides, Apollodorus, and their friends, and which they called “My mythical hero is greater than your mythical hero,” except in Greek, a language which I have learned four times and forgotten five. The play of the game is exceedingly simple. One of the wee sprats shall begin with a statement such as, “My uncle the Baron discovered an island made of cheese.” Then, it is up to the next child to best his compatriot’s boast while keeping in the same vein, perhaps by saying, “My uncle the Baron discovered an island made of cheese by sailing upon a mouse.” And then the next little lordling or lady must take it upon themselves to surpass this with a new boast. Eventually, one child will surmount all others in imagination and cleverness—but that same child will then be called upon to expand his story and tell just exactly how his uncle could accomplish such an amazing feat. As you can easily see, my game promotes the noble faculties of quick-wittedness and the ability to talk your way out of trouble, rather than relying solely on your prodigious dueling abilities and the strength of your right arm. I won’t hesitate to suggest that it should be taught in schools everywhere for the betterment of the nations. Though it appears our voyage shall take us out of doors, for the impertinent help are now sweeping beneath our feet while maintaining unbroken eye contact. It is quite eerie, and I shall be forced to fight at least three duels because of this. Until our next meeting then, my friends! 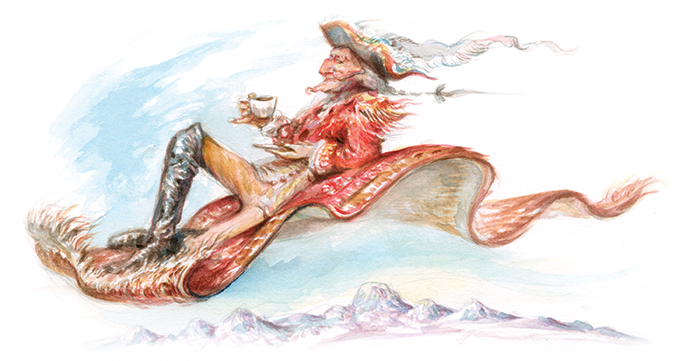 The Extraordinary Adventures of Baron Munchausen is a storytelling game that invites you and your friends to spin yarns of your most outrageous exploits. During the game, each player must tell a story, while the other players attempt to interject and stage interruptions or distractions. The player with the best story at the end of the game is the winner.